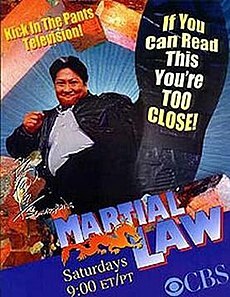 Martial Law is an American/Canadian action adventure comedy series that aired on CBS from September 26, 1998 to May 13, 2000, and was created by Carlton Cuse. The title character, Sammo Law (Sammo Hung), is a Chinese law officer and martial arts expert who comes to Los Angeles in search of a colleague and remains in the US. The show was a surprise hit, making Hung the only East Asian headlining a prime-time network series in the United States. At the time, Hung was not fluent in English and worried about the audience's ability to understand him. In many scenes, Hung does not speak at all, making Martial Law one of the few US television series to feature little dialogue from the lead character. The show lasted two seasons, before being cancelled due to high production costs and Hung being unhappy with the writing of season 2. The creator, Carlton Cuse was aware that CBS was in need of a show that would attract young male viewers to its Saturday night schedule. Stanley Tong suggested a cop show based on Police Story 3: Super Cop, a movie that he directed and Jackie Chan starred in. Jackie Chan was contacted by Tong, but declined (Chan was set to appear in episode 5 "Cop Out", strolling into the background of one scene; however, the bit was cut from the final version). Shannon Lee also guest cast as Vanessa Feng in episode 8, "Take Out". Tong then approached Sammo Hung, a good friend and occasional co-star of Chan's. Still eager to fill the 9pm program slot, CBS agreed very quickly and production began on the series. After the first six episodes had aired they knew it was a hit. The production however was not without complications, as Hung was used to the control over filming he had in Hong Kong and was not fluent in English. Hung was not delighted to be filming in early mornings and late night that American television productions require. New executive producers Lee Goldberg and William Rabkin took the helm at the beginning of the second season due to runaway production costs. They more or less pretended that the first season did not exist, retaining only the basic concept of a fish-out-of-water detective. Cast members Louis Mandylor and Tom Wright were dropped. Gretchen Egolf was brought in to play the unit's new leader, Amy Dylan, from the beginning of Season 2. Additionally, Parker's past in public relations was scrapped. The first season's cliffhanger ending (plus the dropping of Mandylor and Wright's characters) was explained away with a few throwaway lines. Law made crossover appearances on episodes of Early Edition and Walker, Texas Ranger, the former preceding it and the latter following it in its Saturday time slot. Chuck Norris's Walker character, Cordell Walker, also made an appearance as part of the two-part Martial Law/Walker, Texas Ranger crossover. The basic storyline is that Sammo Law, a well-respected Chinese cop, is transferred to America. As he works for the police department, fighting crime in Los Angeles, he is met with a clash in culture. He is also the mentor of Grace "Pei Pei" Chen, an undercover officer. When American techniques do not work, Sammo employs some Chinese cop work to get the job done. Sammo is sent by the Chinese government to apprehend an old nemesis, Lee Hei (Tzi Ma). He finds out that his disciple, Pei Pei, had infiltrated Lee Hei's criminal empire. His goal is to capture Lee Hei and end his criminal organization. Unfortunately, this plot line was unresolved and Season 1 ended in a cliffhanger, although season two's premiere has Sammo alluding to Lee Hei's death (by way of accusing a one-shot villain of trying to avenge it). Dana Dickson (Tammy Lauren) was initially billed as a main character but left after only a few episodes; it was explained that she had moved to another police force to be closer to her family. After Winship's retirement and Louis's transfer to the NYPD, Law decides to stay in Los Angeles and is now partnered with Pei Pei. The department also gets a new captain, Amy Dylan, who thinks that the Chinese way of police work is not the best way of handling things. In addition, there are revelations of a secret society whose members include Law's long lost son. While Law decided to return to China in the last episode, a line of dialogue leaves open the possibility of a follow-up. "Honor Among Strangers" is part one of a crossover with Walker, Texas Ranger where Sammo teams up with Cordell Walker to apprehend a hate-mongering former military officer who later escapes Walker's custody in the Walker, Texas Ranger episode "The Day of Cleansing". The show aired on Saturday nights throughout its run. In Ireland and the UK, Martial Law has been broadcast on Bravo throughout the week. In Britain the show used to air on Five from 1998–2005, then on ITV4 showing replays of the episodes from 2005–2007, from 2009 onwards Bravo have acquired the rights to show replays of the show. In France, Martial Law (Le Flic de Shanghaï) can be seen on M6 and W9. It was previously broadcast on Britain's Channel 5 at 8pm on Sundays scoring high ratings in 98, Australia's Seven Network in 1998, on ATV in Hong Kong, on TV4 in Sweden and on TV3, Sky1 and Channel 4 in New Zealand. It was previously broadcast on Dubai based MBC 2 but can now be seen on MBC Action. In Germany the series was broadcast on VOX. In Brazil, the series can be seen on Rede Bandeirantes since November 2007 as Um Policial da Pesada ("A heavy-set cop"). In Colombia the series was broadcast on RCN Television. In Hungary the series aired on RTL Klub as A harc törvénye ("The rules of engagement"). For many years fans had petitioned for the show to be released onto DVD. On May 4, 2015, it was announced that Visual Entertainment had acquired the rights to the series and will be releasing the complete series on DVD for the first time in the early spring of 2016 in the USA and Canada. According to Visual Entertainment the Boxset was released on August 30, 2016 and will also includes the crossover episodes from the shows Early Edition and Walker, Texas Ranger. ^ Flaherty, Mike (1998-10-09). "Chop Shtick". Entertainment Weekly. Retrieved 2010-12-07. ^ McDonald, William (1998-09-26). "Kung Fu Show Adds Star, Hoping For a Hit". The New York Times. Retrieved 2010-11-05. ^ Johnson, Allan (1999-05-07). "`Martial Law's' Hung Is Changing Stereotypes". Chicago Tribune. Retrieved 2010-11-05. ^ Sterngold, James (1998-11-19). "TELEVISION REVIEW; Body Slams Illumined by Aphorisms". The New York Times. Retrieved 2010-11-05. ^ Rosenberg, Howard (1998-09-26). "If Your Fantasy Is Fascinating Shows, Forget It; TV reviews: 'Fantasy Island' treads water; 'Martial Law,' 'Cupid' don't zing". The Los Angeles Times. Retrieved 2010-11-05. ^ "Sammo Hung refused to shoot "Martial Law III"". singtao.com. Retrieved 20 December 2013. ^ "Black Belt Sep 2000". ^ "Television: Mean Unlean Machine". Time. 1998-10-19. Retrieved 2010-11-05. ^ Michaelson, Judith (1998-10-31). "MORNING REPORT; Arts and entertainment reports from The Times, national and international news services and the nation's press". The Los Angeles Times. Retrieved 2010-11-05. ^ a b c d e f g Meyers, Richard. Films of Fury: The Kung Fu Movie Book. ^ "Jackie Didn't Make the Cut: The True Story of Jackie Chan on Martial Law". CBS. Archived from the original on 22 August 1999. Retrieved 11 January 2018. ^ Reid, Craig.D (Feb 1999). Black Belt Feb 1999. p. 33. Retrieved 6 January 2018. ^ Black Belt Sep 2000. Sep 2000. p. 78. ^ "Martial Law: Shanghai Express". yesasia.com. Retrieved 11 February 2013. ^ "Martial Law: Diamond Fever". yesasia.com. Retrieved 11 February 2013. ^ "Martial Law: Dead Ringers". yesasia.com. Retrieved 11 February 2013. ^ "Martial Law: Funny Money". yesasia.com. Retrieved 11 February 2013. ^ "Martial Law: Extreme Mesures". yesasia.com. Retrieved 11 February 2013. ^ "Martial Law: Trackdown". yesasia.com. Retrieved 11 February 2013. ^ "Martial Law: Take Out". yesasia.com. Retrieved 11 February 2013. ^ "Martial Law: Lock-Up". yesasia.com. Retrieved 11 February 2013. ^ "Martial Law: Substitutes". yesasia.com. Retrieved 11 February 2013. ^ "Martial Law: Trifecta". yesasia.com. Retrieved 11 February 2013. ^ "Martial Law Collection". yesasia.com. Retrieved 11 February 2013. ^ Lambert, David (20 June 2016). "Martial Law - Summer Release, Bonus Episodes for VEI's 'Complete' DVDs Coming in August, the studio informs us, with two crossover episodes!". TVShowsOnDVD.com. Archived from the original on 27 July 2016. Retrieved 17 July 2016. ^ "Martial Law -The Complete Collection". Visual Entertainment. Retrieved 23 July 2016. ^ "Martial Law -The Complete Collection". Amazon.com. Retrieved 23 July 2016. This page was last edited on 25 April 2019, at 15:32 (UTC).